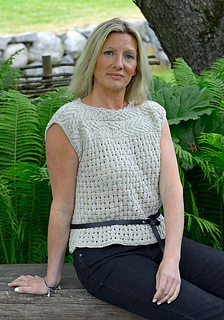 An airy, relaxed top that is easy to knit, easy to wear. The cable panels are knitted across and stitches picked up along the long sides and then the unusual lacy basketweave pattern is knitted from the top down. This makes it easy to adjust the length. There’s barely any shaping and very little finishing.